Figure Digital’s Panopticam camera system was designed to bring film exhibition and virtual reality together, offering viewers a full 360-degree sphere of vision. 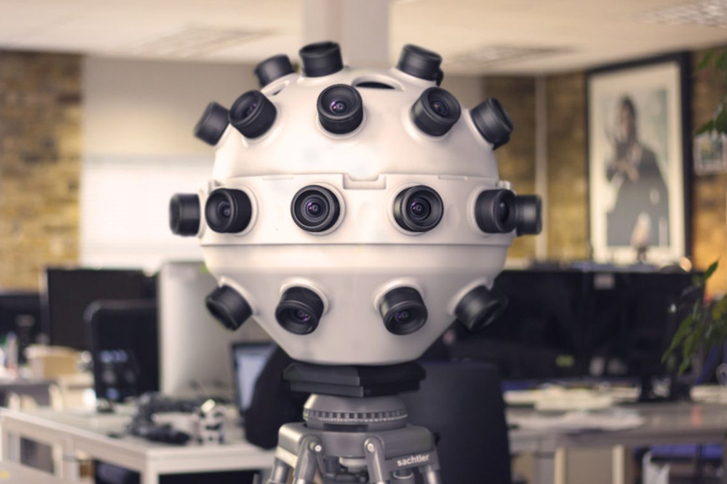 The bumble ball-like device features 36 high definition cameras mounted into a 3D printed spherical case that stands on a tripod. A custom-built editing plugin for Adobe After Effects stitches together the captured video footage so it can be played back in the immersive environment of a VR headset such as Oculus Rift or Morpheus. Last month, we reported that British TV producer Atlantic Productions is developing VR narrative content, including documentary and drama pilots for Facebook’s Oculus Rift and Sony’s Morpheus. And Jaunt has its own cinematic VR solution, including a device that looks very similar to the Pantopticam. The Palo Alto-based startup has raised $7 million to produce VR movies. “We hope that content creators looking to design mind-blowing VR video-based experiences (or hybrid video/CGI VR content) will, in future, be shooting with a Panopticam to create truly cinematic-quality VR,” said Joe Kletz, Figure Digital’s creative director, as quoted in Wired. Still in development at the company’s London studio, no release date has been announced for the Panopticam.